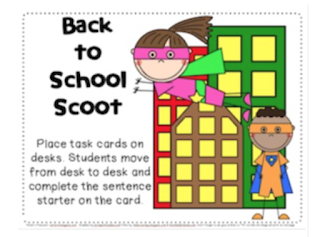 Classroom Freebies Too: Back to School Scoot Freebie! Back to School Scoot Freebie! Looking for a fun Back to School activity that gets your kiddos out of their seats and moving? Scoot activities are guaranteed to get your kiddos engaged in a fun activity while you need a little time to get all your first of the year forms and supplies checked. Just click on the pic below to visit my blog, Pitner's Potpourri, and get this fun freebie!